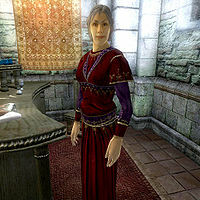 Palonirya is an Altmer clothier and proprietor of the fashionable clothing store Divine Elegance in the Imperial City's Market District. Palonirya sells and buys clothes and provides master training in Mercantile. Her store is also the only place you can acquire the unique Quicksilver Boots. She's well known as a brilliant clothing designer as well as a tough negotiator, and her designs are so popular even the counts and countesses around Cyrodiil wear them. Despite this, Palonirya keeps a relatively quiet existence, living the hard life of a merchant with much work and little spare time. She sleeps in the private quarters above the shop and wakes up every morning at 6am. She starts out with a two-hour breakfast in the main trading room before she unlocks the door for customers at 8am. After offering her services for twelve full hours, she finally closes up shop at 8pm and leaves. On Morndas, Middas and Fredas, she heads to the Merchants Inn and takes her dinner with the other merchants and traders. On Tirdas, Turdas and Loredas, she leaves the Market District and takes a stroll around the Arboretum. On Sundas, she heads to the Green Emperor Way to secretly spend time with her love interest Sergius Verus. She always heads back to the shop and her bed at midnight. Not surprisingly, her choice in clothing shows class: a red velvet blouse along with a red velvet garment and gold trimmed shoes. She carries around the shop key and a large amount of gold. The first time you visit her in her shop, she will greet you: "You've come to Divine Elegance because you care about what you wear. And Palonirya has what you want... or no one has." When asked about the Imperial City, she will go into details: "Anyone can wear clothes. But the RIGHT clothes? That is not so easy. Go to any castle. They wear Palonirya's designs or they're nobody." When you have gathered the necessary prerequisites[clarification needed] to approach her about training, she will give you the following philosophy and task you: "Training? Well, my dear, good business sense is just something that comes naturally to me. You've got to have the know-how, or else I can't teach you anything at all. Do you have what it takes? Do you even know what it takes? Gold, that's what! Septims, and lots of them! Show me that you've got the starting capital, at least ten thousand in liquid assets." and "Show me that you can raise at least ten thousand gold for a business venture and I'll help you learn how to put it to good use." When you have found the amount of gold she requested, she will say: "Well, will you look at that. Quite a bit of gold you have there... so beautiful, isn't it? Perhaps you are capable of being a decent trader one day. Well, with that kind of money, anyone can be, after all. I shall be happy to impart you the knowledge I've gained over the years... for a price, of course. I wouldn't have it any other way." Wow. Palonirya is a tough negotiator. Hard to get her prices down. I don't know that anyone in Cyrodiil drives a harder bargain than Palonirya at Divine Elegance. Have you ever met anyone who barters better than Palonirya? Is there a tougher person to get a deal from than Palonirya? She is certainly good. I'm glad she's willing to teach others. The two advanced trainers in Mercantile also have nice things to say about Palonirya. In Leyawiin, Margarte will tell you either: "If you're looking to be the best in business, you need to learn from the best. Palonirya is one of the best, so you might try asking her. She has a very successful shop in the Market District of the Imperial City." or "Travel to the Imperial City, and speak with Palonirya." In Chorrol, Seed-Neeus agrees: "Palonirya is one of the wealthiest traders in Cyrodiil. Her shop in the Imperial City is so successful. If anyone can teach you more, she can." Palonirya is one of the characters affected by a well-known audio glitch. Esta página foi modificada pela última vez à(s) 15h02min de 4 de dezembro de 2014.